One can imagine the Marchesa Brigida Spinola Doria held a secret behind her lively expression. 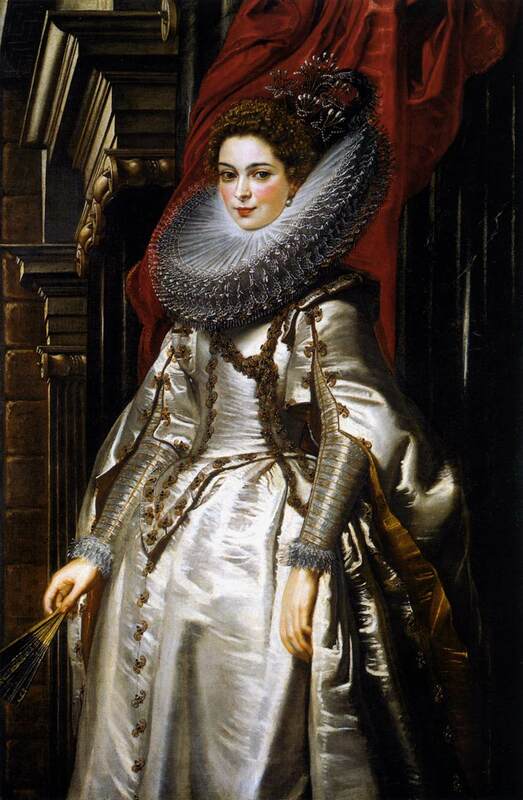 Peter Paul Rubens painted her in 1606 when he, a keen student of the Italian masters, was 28. She was 22, a pink-cheeked newlywed from a leading family in Genoa. A year prior in July 1605, she had married her cousin Giacomo Massimiliano Doria after receiving a matrimonial dispensation from the pope. This was a common exemption in canon law that allowed members of consanguineous aristocratic families to marry and proved especially useful where powers were centralized among the exalted few. 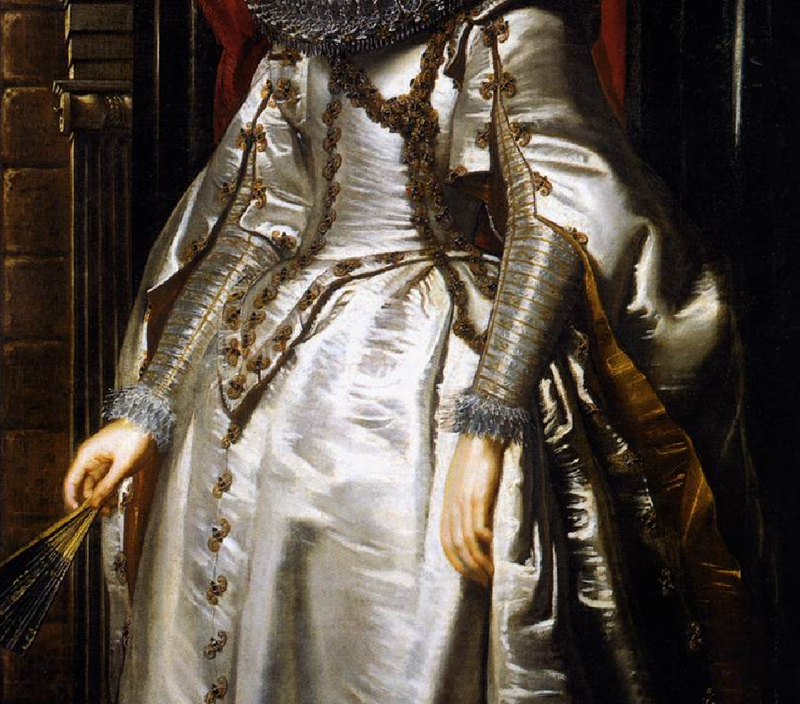 Although this portrait is considered one of Rubens’ finest, not much is known about the Marchesa. We know that her first husband died and that she remarried, but there is no recorded date for her death. If lengthy accounts of her life exist, they appear to be moldering in libraries somewhere. 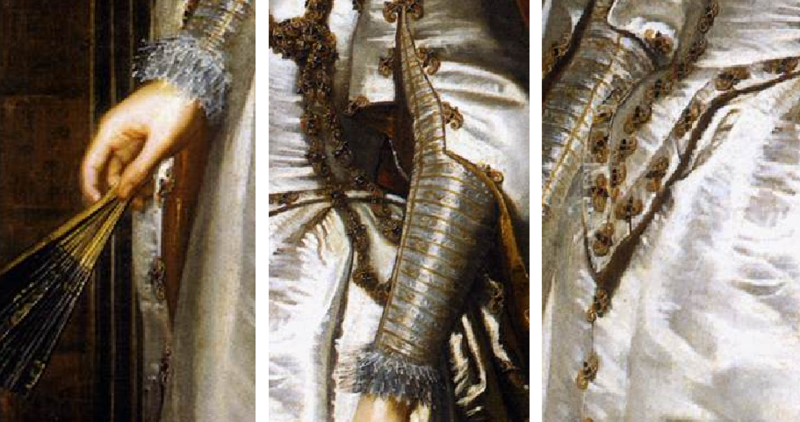 Given the date of the portrait and her elaborate styling, she is believed to be wearing her wedding finery. The original portrait was cut down to its current size between 1854 and 1886, possibly because of water damage, and showed an open landscape to the Marchesa’s right. In full view, she would have stood on the terrace of a palace, a scene intended to arouse an impression of wealth and power. The tight crop makes the detailing all the more exquisite, from her luminescent silk gown to the crimson drapery behind her. 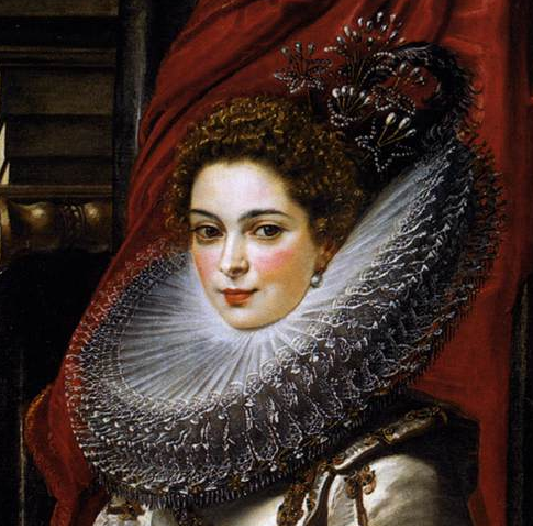 Similar to Rubens’ portrait of Maria Serra Pallavicino, her Elizabethan ruff is among the most elaborate I’ve ever seen. I half wonder how she managed to move her head, although perhaps this is apropos her fate. A Spinola by birth, the Marchesa married into the Dorias. By the 16th and 17th centuries, the Dorias–a feudal, soldiering lot–had become the richest family in Genoa. Their principal spheres of influence resided in banking and the military, and as part of the “aristocratic republic”, they occupied seats in government as ambassadors and prelates. Six Dorias rose to power as doges between 1528-1797, which ensured their place at the top of Genoan society. The Spinolas had a similar pedigree. Although having descended from their heights in the 13th and 14th centuries, they held prized roles in society, making a match between the two families an exceptional one. The Marchesa’s portrait currently hangs in the National Gallery of Art in Washington, D.C. It has had a long ownership history and is one of Rubens’ few surviving portraits from his Italian period of 1600-1608. Influenced by Veronese, Tintoretto, and principally by Titian, Rubens’ style in painting the Marchesa would later make its mark on Sir Joshua Reynolds and Thomas Gainsborough, two prominent 18th century painters. This portrait of the Marchesa is one of my favorites. She’s more than beautiful; she’s intriguing, and I’m not sure if it’s Rubens skill in enlivening his subjects or merely reflecting their depths that makes the portrait so compelling. All I know is that canvassing the Italian aristocracy in his search for greatness works for him here. He captures the Marchesa’s elegant intensity with such mastery that it’s hard to look away once she’s held you in her gaze.